Rock On Slots is a classic video slot made by Rival Gaming. Featuring loads of rock stars, including the legend that is Elvis himself, this is a really fun game with some of the best music and sound effects yet seen in an online slot machine game. One of the best features of Rock On slots, is the expanding Wild. When you get two or three of these in a row, the wins can really add up and it gets very exciting if you hit a couple in a row, waiting and watching to see if a third one will come in. The expanding Wild symbols are even more exciting when you play for cash, because it means you could be on your way to a jackpot if you look like you might get 5 of them in a row. 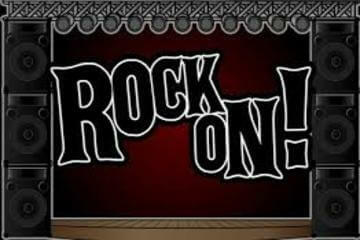 Rock On is a 5-reel, 20-payline slot machine, powered by Rival Gaming. The game is inspired by famous rock stars, so the reels are populated by Elvis, Jimi Hendrix, George Harrison, Gene Simmons, Paul Stanley, Sid Vicious, Axel Rose, and Brett Michaels. In addition, you will come across red electric guitars, green bass guitars, drum sets, peace signs, rock hand signs, and groupies. Rock On slots boast a number of Bonus features, such as green base guitar Expanding Wilds, equipped with a 2x multiplier, the Rock On Bonus round, and the Encore Free Spins feature. Wilds are represented by a green guitar that can substitute for all other icons, apart from drum Scatters and Elvis Bonus symbols. The green guitar symbol also act as an expanding Wild, covering an entire reel to form a winning combination, moreover, whenever it contributes to a win, it will double your balance. The Encore Free Spins are triggered by landing at least three drum set Scatters anywhere in view. That will award five free spins with a 3x multiplier for your wins. The Rock On Bonus round is activated by landing not less than three Elvis symbols anywhere on the reels. Once in, players will be required to use a guitar pick, to try and hit as many musical notes as possible for a cash reward. Each time the Bonus round is launched, players will get to hear one of the seven popular rock songs from the featured musicians. The biggest potential win on Rock On slots is 4,000 coins, awarded in the base game for spinning five red electric guitar symbols on an active line. Given the betting range and the coin value on offer, varying between 0.01 and 0.10, the video slot will hardly meet the needs of high-rolling players, but will, nonetheless, provide loads of fun and adrenaline-fuelled action. Bonuses are plenty with expanding wilds and free spin bonus features as well as an elvis style pick-me bonus round that people love to play.